Watching way too much retro TV this weekend when I should be reading and writing. But last week’s long relentless stress from all angles, to the point that I felt like a baby harbor seal dodging clubs, left me with no alternative than to veg out and regress back to the days when everything was normal. Normal ish.I almost felt bad for Eddy Haskell today. Everyone knows he’s a phony. Ward knows. Barbara Billingsly knows. Heck, Wally even knows. But he stands by his best friend. Puzzling perhaps, and perhaps someone could write, or has already written a doctorate thesis on The Eddy Haskell Syndrome and the Wally’s Who Love Them. So I won’t do that here. You’re welcome. I almost felt bad for Eddy because he thinks the only way he can get attention is by making others look bad. Like the Beav, who Wally loves like a good brother should, telling him when he is acting like a creep versus sticking up for him against his best friend-bully. 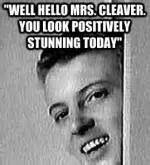 I almost felt bad for Eddy because he feels like he must act like, well, Eddie Haskell. He knows that he is merely tolerated at best. But he’s too proud to admit his failings and appear normalish. The facade is too important, and really holds a life of its own, leaving poor Eddy as an empty shell. Eddy the Narcissist is another thesis out there waiting to be written. No I’m not high. I sound like it though don’t I? I just find it interesting that there are still Eddy Haskells out there in our world 50 years later. And we all know they are phony. And while this is not tolerable to many in our personal relationships, this “Haskelling” is okay and seen as almost admirable In the corporate and political worlds we live in. People who can criticize others and change allegiance are not looked upon as cowards so long as they get us what we want. Because Results are what count. We follow these bullies because they are our bullies. At least for the moment. Until the next election or corporate reorg. One thing about Eddy though. He didn’t get the results. He never achieved anything except mild tolerance on Leave it to Beaver. I think they were trying to teach us something about morality. They failed though, as today’s Eddys are all around us. And because we let them get results for us instead of calling them out. Wally should have known better. Look what he started. 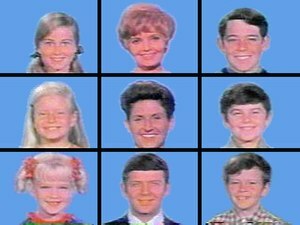 This entry was posted in Encouragement, Forgiveness, Intolerance, Self esteem and tagged Barbara Billingsly, Beaver, Brady Bunch, Bullying, Eddie Haskell, Eddy Haskell, Haskell, intolerance, leave it to beaver, Programming, Retro TV, the Brady bunch, Wally, ward cleaver by pattytmitchell. Bookmark the permalink. So Patty, who’s bullying you and why are you letting it get to you? I love your work, many others do too! You’re funny, real, and a great storyteller. Please let those wielding the clubs that are beating you up be stopped. You are the triumphant author of a marvelous book (despite the opinion of your detractors. Don’t let them get you down. Keep shining. You have angels at your side. HUGS!!!! Thanks Laura. You are such a great and inspiring person. Didn’t want to come off as pity party patty. I am just a little too easily overwhelmed these days. No one bullying me or mine thankfully. Just one of those things I notice more when I get a little too introspective. Getting my first pages done of Don’t Call Me Poundcake so they can be reviewed by some very cool YA and children’s authors in September. Maybe since that story deals with bullying and overcoming obstacles has put me in this state of mind. Promise to be funny and fun again real soon! Hugs right back to you and thanks for looking out for me!! Wow – this is retro TV for sure, Patty. But you know what, bullies are classic. Eddie fits the sterotype perfectly and as a bully, he is relevant today. After working in education for 30 years, bullying hasn’t changed much over those years, except to add bullying by modern tecnology.You are right to say that they are still all around us, but you need to believe in yourself and don’t blame yourself. It is not about you – it is their shortcomings – so don’t let them beat you at the mind game. Continue to build your world with support people. Are you working on that next book? Looking forward to it. Thanks Jovina. Not looking for sympathy just making an observation. True that my detractors did bring me down. But I refuse to let anyone control me. Except my beagle. She has me wrapped around her paw! You need to write your book so we can take our show on the road!!! But I am working on book 2. Ramp up is hard with all the other priorities. But it’s happening. A friend of mine sent me the link to your blog. FYI: I am a writer living in Los Angeles and have a contract with Ken Osmond (Eddie Haskell) to write his life story. There are lots of interesting facts from his real life that people don’t know about, but the book will be set against the backdrop of what I call the “Eddie Haskell” phenomenon. Fifty years after the show ended, he’s still going strong as the poster boy and synonym for the sneaky, rotten kid. Awesome!!! Thanks so much for sharing this!